If you have an obit to add to this page, please email it to me at the address below. The obituary for Price Walter Heath (Pine Bluff Commercial, Jefferson Co AR Tuesday May 6, 1986) read: Price Walter Heath, 87, a Pine Bluff resident for a year, died this morning at Pine Bluff Nursing Home. Heath was born and raised in Mineral Wells (Palo Pinto Co) TX and had lived there most of his life before moving to Pine Bluff a year ago. He worked as a truck foreman for Texas Power and Light Company and was a member of First United Methodist Church of Mineral Wells. He was a son of Walter and Frances Price Heath. Survivors include two sons, Robert Heath of Houston and William Heath of Pine Bluff, two daughters Bonnie Garner and Patricia Allen both of Pine Bluff; four grandchildren, and five great-grandchildren. Local arrangements for Heath are being handled by Ralph Robinson and Son Mortuary. Funeral arrangements will be announced by Baum Carlock-Bumgardner Funeral Home of Mineral Wells. Price Walter Heath was the son of Walter Lee Heath born 24 Sept 1868 d. 9 June 1925 who married 15 Jan 1890 Frances Caroline 'Fannie Price b. 18 March 1874 d. 26 Nov 1955. Walter and Fannie Heath operated a livery in Mineral Wells with horses, buggies and early automobiles for hire. Fannie was a member of the First Christian Church in Mineral Wells. Walter Lee Heath was the son of William Spencer Heath born 20 May 1836 and his wife Alice Toleta Rainbolt. William Spencer Heath was the son of Richard Blue Heath born 15 Feb 1803 in Berkeley Co WV and his wife Sarah Elizabeth Jordan b. 1810. Richard Blue Heath was the son of Israel Heath born 1773 Berkeley Co WV who married Elizabeth Blue. Jacob H. Edwards, the subject of this sketch, was born in Alabama, Aug. 17th, 1829. About the year 1849 he moved with his father to the state of Arkansas, where he was married to Miss Saterwhite in 1851. About the year 18__ he moved to Louisiana, where he lived till 1870. In this year he move to Limestone County, Texas. Here he lost his companion, and four years later (1874) he was married to Mrs. Mary L. Wynn, who survives to mourn his departure. In the year 1879 he moved to Palo Pinto county and settled at the place recently occupied by Mr. J. F. Rice, near Gordon. For a number of years he has lived in the town of Gordon, and throughout the town and surrounding country the circle of his friends was as large as that of his acquaintance. None knew him but to respect, then honor, then love him. Those who have known him most intimately testify that as husband, father, stepfather, he was tender, loving and devoted. On Tuesday night, Feb. 9th he was taken with a chill, and by daylight a genuine case of pneumonia was developed, and it was evident to all that he could not survive. About half-past three o'clock on Monday, the 15th, a neighbor entered his room and enquired how he felt, when he partially raised up and calmly remarked, "I am well" and laid down and quietly breathed his last. He was a member of the Masonic Fraternity, and was buried on Tuesday the 16th with the honors of that ancient order. Several neighboring lodges were invited to join the Gordon Lodge in the ceremonies, which were very impressive and calculated to reflect credit upon the order. The town and community turned out en masse to pay their last respects to the honored corpse. The procession that followed the remains to the cemetery was perhaps over a quarter of a mile long. Thus has passed from among us one whom we highly esteemed, but whose excellent qualities we did not so fully realize till we felt that he was gone to return no more. them in this sore trial. 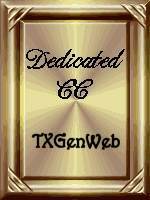 Grover Cleveland Lee Jr. 77, went to be with the Lord on June 3, 1995. A loving husband and father. Grover was born on July 11, 1917, in Utica, New York, and resided in Texas since 1931. He was a member of the First Baptist Church of North Houston, Strawn Masonic Lodge A. F.& A.M. 906, American Association of Retired Persons and the National Council of Senior Citizens. He was employed by the Houston Chronicle from 1966 until he retired in 1991. As a youngster Grover was a disc jockey in Ranger, Texas, and immediately took to his calling in Journalism. He attended Texas Christian University, University of Texas and Texas Weslayan College. As a member of a third generation newspaper family, he was editor of many small dailies and weeklies such as the Strawn (Texas) Tribune, Ranger Sunday Times, Texas Democrat, and others in Texas and Oklahoma. Grover was Executive Director of the National Livestock Association in the 1950's and previously published the Texas Livestock Journal. His other publications include Fort Worth (Texas) Press, Eastland Telegram, Ranger Times, Tulsa (Okla.) Daily World, Houston Chronicle (Production) and many more he is equally proud of in Michigan and Ohio. With Grover's experience from Reporter to Composition in newspaper production, he has been the recipient of many awards and recognition in his field, among them are awards by the Texas Press Association for Advertising Layouts and Copy. A special U.S. Treasury Department Citation and widespread national publicity in publishing trade journals for U.S. War Bonds. Special Newspaper promotion early in W.W. II. He was quoted several times in the Congressional Record, compliments of the late President Lyndon B. Johnson. Grover also received many citations and certificates during his journalistic career for participation, service, publicity and promotional activities on behalf of such organizations as Texas Livestock Markets Association, American Red Cross, American Legion, American cancer Society, Veterans of Foreign Wars, Disabled American Veterans, Future Farmers of America, and many others. Chambers of Commerce and Civic organizations. Of all the awards and recognition received in his lifetime, Grover was most proud of his family. He is quoted from one of his many letters sent to his family. " I have no material possessions of any note, but by the Grace of Our God when we depart this living routine, I leave behind a Priceless Treasure-A bountiful gift of My Creator, five daughters and three sons. " Upon his death he was reunited in heaven with those who preceded him, his parents Grover Cleveland Lee Sr. and Muriel Lee. His sister Audrey Muriel Lee and grandson Burt Wayne Buddy Williams. Grover is survived by his wife of 42 years, Betty Jo Lee, his eight children all of Houston. Grover Cleveland Lee III, Audrey D'anne Lee, Glenda Sue Moses, Juanita Marie (Tammy) Williams, Garrett Stewart Lee, Judy Rose Mikulin, Cleveland Steele Lee, and Audrey Lisa Vodehnal. Eighteen Grandchildren Greg and Susie Lee, Christina Yarletts, Johnny Moses, Rebecca Moses, Karen Moses, Wesley Moses, Roberta Burg, Mark Williams, Chuck, Rebecca, and Jason Lee. Jonathan and Justin Mikulin. Joshua, Matthew, and Stacey Vodehnal. Fourteen great Grandchildren	Matthew Yarletts, John Michael Moses, Tyler Tolpaka, Megan and Ryan Moses, Lesley and Courtney Moses, Krystal and Nicholas Burg, Alissa and Kara Williams, Kirsten and Zachary Lee, and Coby Deckard. A brother in law Joe T. Stoker, nieces Hillis Bass, Laura Morris and nephew Jody Stoker. A private memorial service will be held at First Baptist Church of North Houston. A Masonic burial will follow in Strawn,Texas. Betty Jo (Mccorkle) Lee passed away in Houston, on Wednesday, August 11, 2004 after a long illness, which she fought courageously. She was comfortable, at peace, and surrounded by her family. She was proceeded in death by her husband of 42 years Grover Cleveland Lee, daughter, Glenda Lee Moses grandson, Buddy Williams, and her beloved parents, the Reverend Ray Bartlett and Rosalie Mccorkle. Betty is survived by seven children: Grover Cleveland Lee III, D'Anne Lee, Tammy Williams and husband Dale, Gary Lee and wife Gayle, Judy Rose Lee, Cleveland Steele Lee and Audrey Lisa Lee Vodehnal and husband Ron. She is also survived by her grandchildren; Gregory Lee and wife Shari, Susan Lee Poppinga and husband Ted, Craig Yarletts and wife Vicki, Christine Molina and husband Mario, John Moses Jr. Rebecca Tolpaka and husband Carl. Karen Stone and husband Peter, Wesley Moses and wife Mendy, Roberta Burg and husband Steve, Mark Williams and wife Cindy, Chuck Lee and wife Melissa, Rebecca Hodges and husband Keith, Rev. Jason Lee, Jonathan Mikulin, Justin Mikulin, Joshua Vodehnal, Matthew Vodehnal, Stacey Vodehnal. Twenty- five great grandchildren, two nieces and a nephew also survive Betty. Our family thanks the ICU staff at Cypress-Fairbanks Hospital and Kindred Hospital Northwest for the excellent care given during her very long hospitalization. We will always be especially grateful to doctors Reininger, Venkatesh, and Pandya for their care and concern. Our mother had an unwavering faith and devotion to Jesus Christ. She faced her illness and her death with Strength, courage, dignity, and an undying love for her Savior. During her life on earth she always looked heaven bound because she knew this wasn't her permanent home; She was only "passing through." She fought the good fight, she finished the race, and she kept the faith. She now rests in the loving arms of her Lord who welcomed his good and faithful servant to her heavenly home. Grover Cleveland Lee, III, lovingly called “Skipper” by his family, went to be with the Lord on August 4, 2007. He passed away from pneumonia at Veterans Hospital in Houston. His family was at his bedside where his passing was quiet and peaceful. He went to be with the Lord at 11:34 a.m.	Skipper was born to Grover Cleveland Lee, Jr., and Juanita Marie Guthrie Lee on April 2, 1939. He was delivered by Dr. Pedigo at the Strawn Hospital. Of course, his family couldn’t have been prouder…a boy…another Grover! He was the oldest of 8 children…he had two brothers, Garrett Stewart and Cleveland Steele…and five sisters…Audrey D’Anne, Glenda Sue, Juanita Marie “Tammy”, Judy Rose, and Audrey Lisa. Much of his younger years were spent in Texas and Oklahoma. He was born into a “newspaper” family and was very proud of his heritage. As a little boy, he worked side by side with his Dad, Grover Jr., at their family owned and operated newspaper, “The Strawn Tribune.”	He lovingly recalled how much he loved his Dad and memories of following behind him, trying as best he could to keep up with his Daddy’s long legs and big steps. He was proud to be Grover Cleveland Lee, III…namesake of his beloved Grandfather and Father. Skipper served in the United States Navy from July 22, 1957 thru July 22, 1961, when he was honorably discharged. He had a deep and abiding love for his country and a great respect for the U.S. Military. Skipper married the late Mary Louise Bryant on November 28, 1963 in California. He was the proud father of two beautiful children. His oldest son Gregory Guthrie Lee was born on January 15, 1967, in Inglewood California. Skipper said one of the greatest moments of his life was when his son was born. Skipper was a very private person in his last months of life. His health had begun to deteriorate and he had become very reflective of his life. He talked about his children and how much he loved them and always would. He loved his siblings and many nieces and nephews and shared memories during those last months. He was a very proud man and a very intelligent one. He was a great conversationalist and was well educated on many subjects …including religion, politics, current affairs, to name a few. He was a Republican, all the way! He had a memory like an “elephant.” He could recall so many events and dates from the past with great detail. The greatest Book he read was the Bible. He loved Jesus Christ deeply and knew when he passed he would enter into Heaven and be with his Lord and Savior for the rest of Eternity. He looked forward to “going home” where he would finally be with those family members who went before him. Skipper suffered many setbacks in his lifetime but he always maintained his love for Jesus and never doubted his salvation. He always had that security…knowing he belonged to the Lord. Skipper is preceded in death by his Wife, Mary Lee; his Grandparents, Grover and Muriel Lee; his Mother, Nita; his Father and Mom, Grover and Betty Lee; his loving Sisters, D’Anne Lee and Glenda Moses; his beloved nephew, Buddy Williams; and his Aunt and Uncle Joe and Audrey Stoker and cousin, Jody Stoker. Skipper is survived by his son Greg and wife Shari; his daughter, Susie and husband, Cory; brothers Gary and wife Gayle; Cleve Lee; sister Tammy and husband, Dale; sister Judy Lee; sister Audrey Vodehnal and husband Ron. Other family members include his many nieces and nephews…Christine Molina, Craig Yarletts, Johnny Moses, Becky Tolopka, Karen Stone, Wesley Moses, Roberta Burg, Mark Williams, Chuck Lee, Becky Hodges, Jason Lee, Jonathan Mikulin, Justin Mikulin, Josh Vodehnal, Matt Vodehnal, and Stacey Keogh. Also survived by his great-nieces and nephews: Elizabeth, Dylan, and Travis Molina; Krystal Williams and Nicholas Burg; Aly and Kara Williams; John Michael Moses, Tyler and Madelyn Tolopka, Lesley, Courtney, and Bradley Moses, Megan and Ryan Stone, Kirstin, Zachary, and Kinsey Lee, Coby Lee, Ryan and Autumn Hodges, and Jadon Lee. Also survived by cousins, Hillis Bass and Laura Kaiser. A graveside service will be held at Mount Marion Cemetery in Strawn, Texas. It will be conducted by Skipper’s beloved nephew, Reverend Jason Lee. Date of funeral to be announced to family. Strawn- Grover C. Lee Sr. 78, of Mineral Wells, died at 12:43 P.M. Sunday in a Mineral Wells Hospital after an illness of two years. He was a former resident of Strawn. Funeral will be at Mt. Marion Cemetery at Strawn under the direction of Baum-Carlock-Bungardner Funeral Home of Mineral Wells. Born Dec.19, 1892, in Utica New York, he had lived in the Mineral Wells area since 1935. he was the son of the late Edgar Lee and Allena Davis. He was a member of the Central Methodist Church in Mineral Wells. He married Alena Davis in 1952 in Mineral Wells. He was a retired newspaper Publisher. Suvivors include his wife; one daughter Mrs. Audrey Stoker of Houston; one son Grover C. Lee Jr. of Houston: A stepson, George C. Perkins of Arlington, 16 grandchildren and 12 Great Grandchildren. Strawn- Mrs. Muriel Lee of Strawn died in Houston on Friday. She was a Christian Scientist and a member of the Eastern Star, of which she was a past Matron. She and her husband were former owners of the Strawn Tribune. Funeral will be at 2:00 p.m. Sunday in the Edwards Funeral Home Chapel. Gravesite rites will be in charge of the Eastern Star at the Mount Marion Cemetery. Survivors include her husband Grover Lee Sr. of Strawn, a son Grover C. Lee Jr. of Houston, a daughter Audrey Stoker of Houston. A funeral service was held yesterday afternoon in Strawn Texas for William H. Holmes 75, former Utican and a brother of Mrs. Julia Gorton, 829 Waverly. Mr. holmes died in Casper Wyoming, Feb 1, 1947 after a long illness. He was born in Utica , Jan 25, 1875 and resided here until 1922. He was a member of Faxton Lodge F.& A.M. He was a retired railroad man and had lived in Casper in recent years. On Feb 19,1906 he married the former Allena Davis of Utica who survives. Besides his wife and sister he leaves a stepson, Grover C. Lee and a brother Charles Holmes of Prospect. 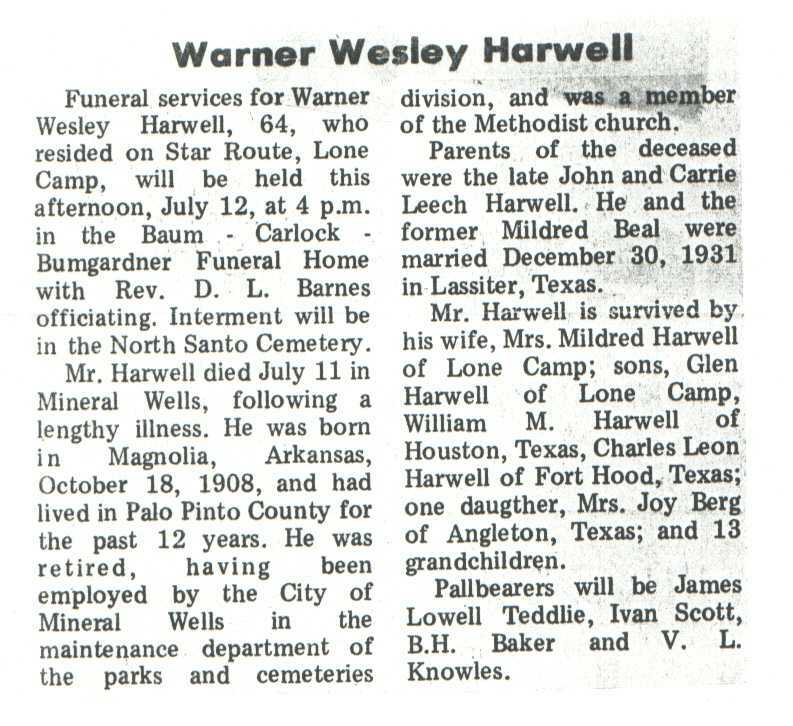 The burial service was under the direction of Strawn Lodge F.& A. M.
The final 30 mark came Tuesday for one of West Texas most colorful old-time newspapermen. Ray B. McCorkle 67 years old and retired publisher, editor, writer, columnist, and clergyman, died Tuesday morning in a Mineral wells sanitorium following a stroke Monday. Making his home in Strawn for the past two years, he had been in failing health since 1954 and became invalided three years ago. Funeral will be held Thursday at 10:00 a.m. at the Strawn First Baptist Church with the Larry Stallings pastor officiating. Burial will be in Mount Marion Cemetery here with Masonic burial rites to be held. Malcolm Funeral Home will be in charge. Born in Navarro County August 10, 1891. The son of a circuit rider and Baptist missionary, the late J.R. McCorkle, he moved to Santa Ana with his parents at the age of three. He began his newspaper career as a printers devil and worked for various weeklies in the area. He launched his own career as a publisher at Peacock at age 16. He later founded one of the Coleman newspapers and over the years was associated with Amarillo Globe News, Lubbock Avalanche Journal and other newspapers. Always lured to adventure and excitement Mr. McCorkle also was a member of the Staff of the Ranger Daily Times during the oil boom days in the early 1920's. In the early 1930's he was a public relations man for the United States Chamber of Commerce headquartered in Ok. City, and was aquainted with the late Franklin Delano Roosevelt, during the early years of his presidency and interviewed him on numerous occasions. Prior to his retirement due to failing health. Mr. McCorkle had resided in Eastland County where he actively associated with newspapers at Eastland and Ranger. He also served for a time as news editor of radio station KERC Eastland. During his employ as editor of the Eastland Daily Telegram, Mr. McCorkle served as Eastland County chairman of the "Democrats for Eisenhower" committee. For his work in that 1952 campaign Mr. McCorkle won personel commendation from the president. He was a former student of Howard Payne Academy and College in Brownwood, where he studied theology and journalism. A lifelong Baptist he was ordained as a minister in 1932 and served as pastor of churches, at San Angelo and in the Big Spring and Fort Worth areas. At the time of his death he was a member of the Eastland Masonic lodge, and also a Shriner. Survivors include the widow Mrs. Rose McCorkle of Strawn, one son J.R. McCorkle of Las Vegas Nev., a daughter, Mrs Grover C. Lee Jr. of Strawn and 15 grandchildren and two great-grandchildren. One brother, Robert F. of Coleman a step brother Horace Fry Lubbock, three sisters Mrs Larue Cox Brownwood, Mrs Melvin Lamb and Miss Mary McCorkle, of Santa Ana one step-sister Mrs. L.L. Evans of Brownwood and an uncle J. Ed Barlett of Santa Ana. Strawn- Funeral for Mrs. Rosalie McCorkle 80, who died Friday, will be at 2 p.m. Sunday in Edwards Funeral Chapel with the Rev. Larry Martin, pastor of the First Baptist Church officiating. Burial will be at Mt. Marion Cemetery under direction of Edwards Funeral Home. Suvivors are a daughter Mrs. Grover C. Lee Jr. of Houston; one sister, Mrs Jim Dew of Lubbock; one brother W.O. Williams of Stanton; 13 grandchildren and 10 great- grandchildren. Another brother, Ivan J. Williams of Sentinel Okla, died about two weeks ago.